​Elbow tendonitis is the inflammation of the tendons surrounding the elbow. 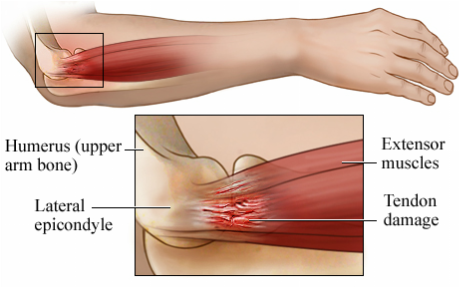 Lateral and medial epicondylitis, also referred to as "tennis and golfer’s elbow”, are two forms of this condition. It is considered a cumulative trauma injury that occurs over time from repeated use of muscles in the arm and forearm. This repeated use can lead to small tears of the tendons. This condition generally affects individuals between ages 35-55, whom are recreational athletes or engages in rigorous daily activities. Therapeutic Exercise focusing on improving elbow range of motion, forearm strength, and sport biomechanics.